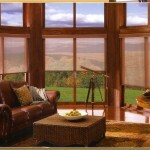 Window treatments with sleek, clean lines have taken over! Many of today’s most popular window treatments are now sporting simpler, more tailored looks, which open up the room, keeping it modern and uncluttered. Smooth, crisp roller shades are one way to achieve this look. 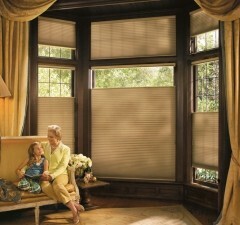 Roman shades are another option for incorporating the tailored look. Try Roman shades with a flat-panel design, for the contemporary feel that you are going for. Cellular shades improve energy efficiency and offer a variety of light-filtering and privacy options, depending on which fabrics you choose. Sunscreen fabrics provide visual comfort by limiting eye-straining glare, maintain view-through so your view from inside is not limited, and provide energy efficiency – all at the same time! And many new window treatments are made of specialty wood alloy materials and fabrics that are anti-static, actually repelling dust! So they look good and clean themselves, too! And all of these options accomplish these functions in a variety of fabrics, colors, patterns, textures, and styles. Not sure which fashion trend suits your needs? Schedule a Free Consultation with us today, we would be more than happy to help your home become Fashion Forward!